Thrilling the literally tens of people who have been waiting with baited, husky-lunged breath for its return—and reminding the rest of us that nostalgia is always a potent force, even when the thing we’re all being nostalgic for is gimmicky, weirdly colored crap—Pepsi has released a new ad announcing the long-hinted return of its translucent boondoggle, Crystal Pepsi. 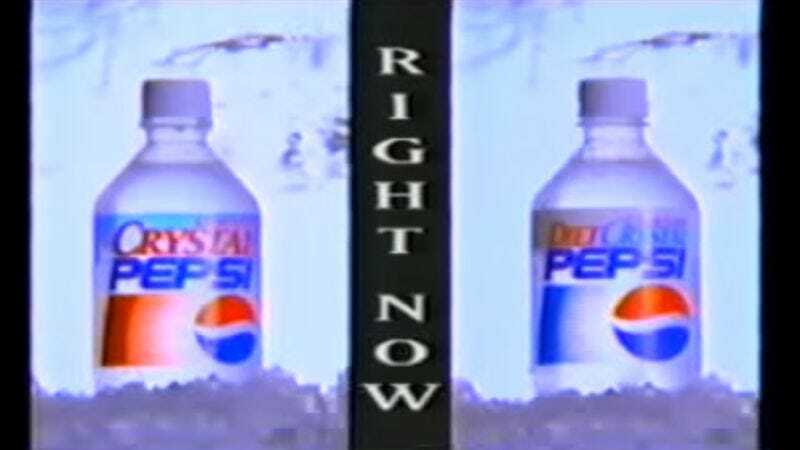 And, ensuring that everyone on the internet doesn’t forget—even for one blessed, Nicktoon-free moment of peace—that the ’90s were, and continue to have been, a thing, the ad in question is steeped in Clinton-era nostalgia (with Van Halen’s “Right Now” being traded out for the percussive irresistibility of “Whoomp! (There It Is)”).